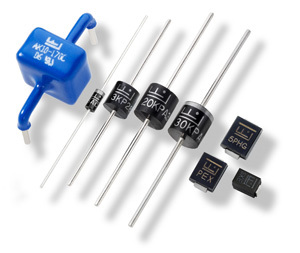 Littelfuse offers a broad range of TVS diodes, including high peak pulse current and peak pulse power options up to 10kA and 30kW respectively. Littelfuse backs our products with over 80 years of circuit protection expertise and application knowledge developed by working with our industry-leading customers. You can learn more about our range of tvs diode products by viewing our TVS diode selection guide. The Transient Voltage Suppressor diode (also known as a TVS Diode) is a protection diode designed to protect electronic circuits against transients and overvoltage threats such as EFT (electrically fast transients) and ESD (electro-static discharge). TVS Diodes are silicon avalanche devices typically chosen for their fast response time (low clamping voltage), lower capacitance and low leakage current. Littelfuse TVS diodes are available in both uni-directional (uni-polar) or bi-directional (bi-polar) diode circuit configurations. TVS Diodes are electronic components designed to protect sensitive electronics from high-voltage transients. They can respond to overvoltage events faster than most other types of circuit protection devices, and are offered in a variety of surface mount and through-hole circuit board mounting formats. They function by limiting voltage to a certain level (referred to as a "clamping" device) with p-n junctions that have a larger cross-sectional area than those of a normal diode, allowing them to conduct large currents to ground without sustaining damage. TVS Diodes are generally used to protect against electrical overstress such as those induced by lightning strikes, inductive load switching, and electro-static discharge (ESD) associated with transmission on data lines and electronic circuits. Littelfuse TVS Diodes can fit a wide range of circuit protection applications but were primarily designed to protect I/O interfaces in telecommunication and industrial equipment, computers and consumer electronics. For insight about other Transient Suppression Technologies and how they compare, please refer to Littelfuse Application Note AN9768. TVS Diodes are used to protect semiconductor components from high-voltage transients. Their p-n junctions have a larger cross-sectional area than those of a normal diode, allowing them to conduct large currents to ground without sustaining damage. Littelfuse supplies TVS Diodes with peak power ratings from 400W to 30kW, and reverse standoff voltages from 5V to 495V. Detailed information about most product series listed here can be found clicking on the series name in the far left column. You can get additional TVS Diode selection guidance by perusing Littelfuse's Electronic Products Selection Guide. Transient Threats – What Are Transients? Voltage Transients are defined as short duration surges of electrical energy and are the result of the sudden release of energy previously stored or induced by other means, such as heavy inductive loads or lightning. In electrical or electronic circuits, this energy can be released in a predictable manner via controlled switching actions, or randomly induced into a circuit from external sources. Repeatable transients are frequently caused by the operation of motors, generators, or the switching of reactive circuit components. Random transients, on the other hand, are often caused by Lightning and Electrostatic Discharge (ESD). Lightning and ESD generally occur unpredictably, and may require elaborate monitoring to be accurately measured, especially if induced at the circuit board level. Numerous electronics standards groups have analyzed transient voltage occurrences using accepted monitoring or testing methods. The key characteristics of several transients are shown in the table below. 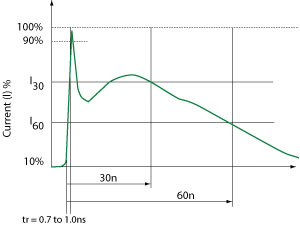 Transient voltage spikes generally exhibit a "double exponential" wave, as shown below for lightning and ESD. The exponential rise time of lightning is in the range 1.2μsec to 10μsec (essentially 10% to 90%) and the duration is in the range of 50μsec to 1000μsec (50% of peak values). ESD on the other hand, is a much shorter duration event. The rise time has been characterized at less than 1.0ns. The overall duration is approximately 100ns. Why are Transients of Increasing Concern? Component miniaturization has resulted in increased sensitivity to electrical stresses. Microprocessors for example, have structures and conductive paths which are unable to handle high currents from ESD transients. Such components operate at very low voltages, so voltage disturbances must be controlled to prevent device interruption and latent or catastrophic failures. Sensitive microprocessors are prevelant today in a wide range of devices. Everything from home appliances, such as dishwashers, to industrial controls and even toys use microprocessors to improve functionality and efficiency. Most vehicles now also employ multiple electronic systems to control the engine, climate, braking and, in some cases, steering, traction and safety systems. Many of the sub- or supporting components (such as electric motors or accessories) within appliances and automobiles present transient threats to the entire system. Careful circuit design should not only factor environmental scenarios but also the potential effects of these related components. Table 2 below shows the vulnerability of various component technologies. Table 2: Range of device vulnerability. Conventional Diode, Rectifier Power Control Useful for "steering" high currents; converting AC to DC. Typically found in large packages such as TO-220. Zener Diode Power Control Useful for regulation of DC voltage in power supplies. Typically found in medium-size to large packages (Axial, TO-220). Silicon Avalance Diode (SAD), Transient Voltage Suppressor (TVS) Over-Voltage Protection Useful for protecting circuits exposed to high-energy events such as lightning surges or voltage transients from mechanical switching of electrical circuits (EFT). Typically found in medium-size packages (Axial, DO-214). Shottky Diode Power Control Useful for high-frequency (HF) rectification required for switch-mode power supplies. Varactor Diode RF Tuning Only known application of diodes that takes advantage of the junction capacitance characteristic. A Schottky diode is formed by a metal to semiconductor junction. Electrically, it conducts by the majority carrier and possesses fast response with lower current-leakage and forward bias voltage (VF). Schottky diodes are widely used in high frequency circuits. Zener diodes are formed by a heavily doped P-N semiconductor junction. There are two physical effects which can be referred to as a Zener state (Zener effect and Avalanche effect). Zener effect occurs when there is a low reverse voltage applied to the P-N junction which conducts due to quantum effect. Avalanche effect occurs when a larger than 5.5 Volts voltage applied reversely to the PN junction during which the generated electron-hole pair collide with the lattice. Zener diodes based on the Zener effect are widely used as voltage reference sources in electronics circuitry. A TVS diode is formed by a specially designed P-N semiconductor junction for surge protection. The PN junction is usually coated to prevent premature voltage arcing during non conducting state. When there is a transient voltage event, the TVS diodes conducts to clamp the transient voltage using the Avalanche effect. TVS diodes are widely used as an over voltage circuit protection device in telecommunications, general electronics, and digital consumer markets for lightning, ESD, and other voltage transient protection. SPA stands for Silicon Protection Arrays. It is an array of integrated PN junctions, SCRs, or other Silicon protection structures packaged in a multi-pin structure. The SPA can be used as a integrated solution for ESD, lightning, and EFT protection for telecommunications, general electronics, and digital consumer markets where multiple protection opportunities exist. For example, it can be used for HDMI, USB, and Ethernet port ESD protection. The device VR should be equal to, or great than, the peak operating level of the circuit (or part of the circuit) to be protected. This is to ensure that TVS Diode does not clip the circuit drive voltage. The Peak Pulse Current (IPP) identifies the maximum current the TVS Diode can withstand without damage. The required IPP can only be determined by dividing the peak transient voltage by the source impedance. Note that the TVS Diode failure mechanism is a short circuit; if the TVS Diode fails due to a transient, the circuit will still be protected. This the peak voltage that will appear across the TVS Diode when subjected to the Peak Pulse Current (IPP), based on 10X1000us exponential waveform. The VC of each TVS Diode is identified in each series data sheet electrical characteristics table. Ensure that the application voltage is less than or equal to the device's standoff voltage, and that the operating temperature limits are within those specified by the device. Please refer to the dimension drawings contained within the data sheet of each series. Please contact Littelfuse if you would like assistance with testing and verifying suitability of a Littelfuse device within your product. 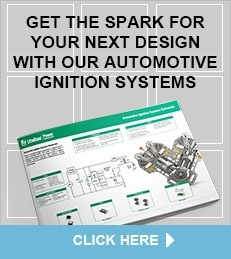 We have extensive product testing lab capabilities and technical expertise to assist you. TVS is a clamping device that limits voltage spikes by low impedance avalanche breakdown of a rugged silicon PN junction. It is used to protect sensitive components from electrical overstress generated by induced lightning, inductive load switching and electrostatic discharge. The minimum and maximum ambient operating temperature of the circuit in which a device will be applied. Operating temperature does not allow for the effects of adjacent components, this is a parameter the designer must take into consideration. The property of a circuit element that permits it to store an electrical charge. In circuit protection, the off-state capacitance is typically measured at 1 MHz with a 2V bias applied. In the case of a uni-directional TVS diode, this is the maximum peak voltage that may be applied in the 'blocking direction' with no significant current flow. In the case of a bi-directional transient, it applies in either direction. It is the same definition as Maximum Off-state Voltage and Maximum Working Voltage. Breakdown voltage measured at a specified DC test current, typically 1mA. Usually a minimum and maximum is specified. Maximum pulse current which can be applied repetitively. Usually a 10x1000μs double exponential waveform, but can also be 8x20μs, if stated. Maximum voltage which can be measured across the protector when subjected to the Maximum Peak Pulse Current. Expressed in Watts or Kilowatts, for a 1ms exponential transient (see figure 1, page 23) it is IPP multiplied by VCL.